Our #1 economy Feather Flag banners are a cost effective, cheap outdoor advertising sign display solution that is widely used for shops, restaurants, churches, real estate open house, and for sale. These Feather Flags are often used as indoor signage solution for trade shows and conferences, in order to attract attention and create traffic to your events, business, products or sale promotions. Our FAST1banner is made of 130gsm polyester textile fabric material, which is water proof and durable for long term outdoor advertising set up. The feather flags pole kit is made of sturdy aluminum pole sections plus elastic top fiberglass rod for bending into the feather shape. There are various kinds of optional Bases to stand up the Feather Banners, in all kinds of ground conditions and environments. The most popular $9.99 cheap ground spikes, allow you to setup the Feather Flags with Pole on grassland, dirt, sand, snow or soil. There are also Lightweight Indoor Stand or Heavy Duty Outdoor Stand that let you quickly set up the flag in any ground surfaces, making these advertising Feather Banner Portable Flags are perfect mobile display sign solution for all kinds of outdoor events or indoor trade shows. How to design my own Custom Feather Flags? If you plan to design your Custom Feather Flags before uploading a custom down jacket flag to our design tools, click on the link to the design template for each size below. 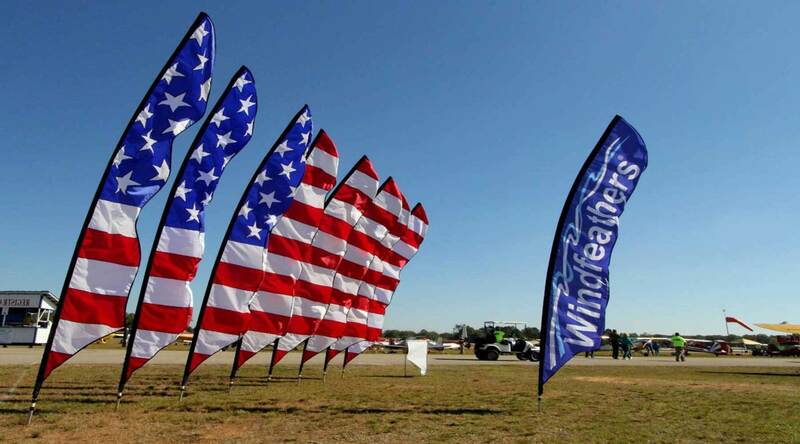 Boost your sales and increase your outdoor advertising exposures for your events and Trade Shows with our quality Custom Feather Flags cheap wholesale discount. Design advertising logo yourself or send us your files (logo, image), we can design them for you free of charge. We also have feather flags, banner flags and outdoor advertising banners in stock and ready to ship. All of our flags are high quality materials made in the United States. If the order is placed before noon, most of the orders are shipped on the same day. Double up your sales by over two times more with our Feather Flags. Find the banner that fits your business and now start earning more money. Our easy online design tool can let you enjoy the design of your own custom ad flags directly on the site. Let your creativity loose and create some awesome signs, the cheap price online. We offer FREE professional manual check of all your submitted images and print file to ensure that print result quality. We would always email you digital proof for approval before printing. Looking for a specific shape of an ad logo that you can not see on our website? contact us. We can usually create strange shapes for outdoor advertising banners. We will show the sketch of the design document, we will try to achieve. We like the challenge, just make sure to order in advance, we have enough time to track and make mistakes. Our stock feather flag will attract more consumers to your business and generate more sales, do not wait - get banner flags to increase your income. These signs are sometimes referred to as "advertising flags". Enjoy big savings with our FREE Shipping USA nationwide (for orders over $100). In the feather flag country, you will find a variety of outdoor advertising sign options. With more than a decade of feather logo experience, we think we are experts. Oh we also have this type of logo patent, so we do give these banner banners live. When you shop with us, you are supporting the inventor of this logo, not the same imitator as other sites. We offer the highest quality but cheap pricing feather flag at the lowest price. There are wide range of sizes and pole heights for you to choose from, and you can rest assured that one of the sizes is sure to fit your activities. All of our custom flags are printed on one side or two sides. We use a 100% blockade between double-sided signs, so there is no bleeding from one side to the other. Our print process has no fancy name. We have modified our printer for many years to print high quality feather logo. We use the commercial printing process, resulting in a lot of popular colors. The back of your flag will not be white, of course unless your base color is white. Since the printing process is digital for all of our logos, you are not subject to color restrictions. Get creative, use real-time images, rainbow, gradients, or anything you can imagine. Every custom logo will start as a blank canvas - what your creativity and vision will help us draw it and make it live.